If there’s one area of skin you choose to focus your attention on, make it your eyes. They’re the biggest betrayer of age, emotion and health and require all the TLC you can muster. Late nights, hangovers or even allergies will have some effect on the fragile fabric around your eyes, and rather than risk the raccoon look, a dab of the best eye creams for men can help restore normality. You may have realised that the women in your life have probably been applying eye cream since their mid-twenties and now, thanks to the influx of male beauty products on the market, you can, too. What’s needed is a unique potion to fortify the skin and banish all signs of a hectic lifestyle, leaving you bright-eyed and bushy tailed everyday. 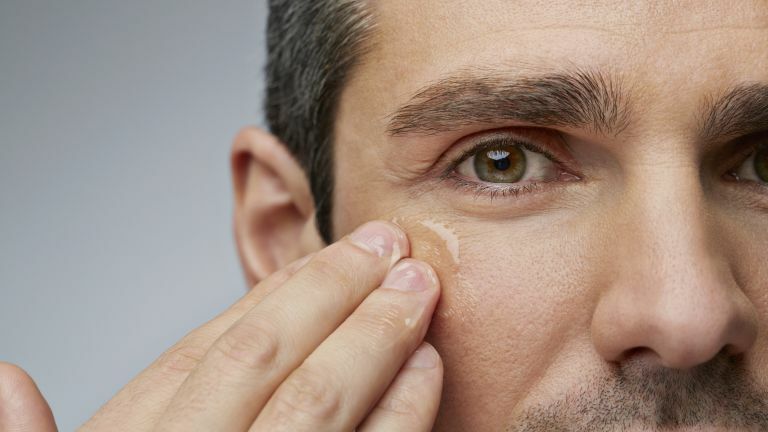 If you’re new to the whole men’s eye cream thing, you’re probably looking for some advice on the kind of product you should be purchasing. Read the section below to pick up some useful buying tips. Some eye creams have been specifically developed to treat one thing, while others offer up something completely different. So, where should you start? When you look in the mirror, what do you see? Are you met with bags and wrinkles that make your eyes appear sallow and tired? If so, you should look out for an eye cream that contains Hyaluronic Acid, as it is known to flatten and fill unwanted lines. If the skin under your eyes is dry and taut, Hyaluronic Acid is a hydrating ingredient, too. Some plants aid in the production of collagen and elastin, which renew the skin; and vitamin rich eye creams can help to keep skin youthful. If you suffer with dry skin around the eyes, look out for hydrating eye creams. We've been wowed by The Ordinary, a brand which exists to give you clinically proven results without having to renew your mortgage - what you see is what you get. Our list of the best men’s eye creams covers a range of products that are renowned for reducing the signs of aging. From names you know such as Clarins to obscure brands such as Shiseido, we feature gels, creams and balms which all differ in their properties – just remember that youthful looks come at a cost. For when you’ve been burning the candle at both ends, or simply suffering from interrupted sleep, you need to wake up tired eyes with a topical caffeine hit. The active ingredient works to constrict the blood vessels under the thin layers of skin, consequently brightening and tightening your snoozy eyes. This may be ordinary by name but it’s exceptional by nature, or rather, nurture. The high dose of caffeine and green tea extract target the betraying symptoms of exhaustion, you’ll be hard pressed to find potency like this elsewhere. It’s a no-frills product with fantastic results that target dark circles, fatigue and puffiness, giving high-end brands a run for their money. At this price The Ordinary is more than eye-deal. Tom Ford's eye treatment is the first line of defence against signs of ageing and fatigue. The eye cream is infused with skin-calming complexes, making it an effective formula to lift and firm skin around the eyes. The metal-tipped, contoured applicator helps cool the under-eye area and reduce puffiness. For when the bags under your eyes are weighing you down, you need products to stimulate circulation to send eye bags packing. Products pumped with arnica will significantly help shrink the luggage beneath your eyes. Stash this secret weapon in the fridge to add a chill to the application. Heal Gel Eye is lightweight and non-greasy and disappears quicker than Vanilla Ice’s music career. Gently pat a small amount around each eye and watch the power of arnica smooth out the sluggish appearance of puffy eyes. One too many late nights at the office (or otherwise) can leave your eyes looking a little worse for wear. Minimise dark circles and fine lines around the eyes with the La Mer Eye Concentrate. This deeply conditioning cream is made with specially formulated hematite which is a magnetically charged mineral that contributes to a reduction of unevenness and discolouration of the skin. When used on a daily basis, this cream helps to reveal a brighter, more radiant complexion while fine lines and wrinkles are nowhere to be seen. The idea of dehydrated eyes seems somewhat odd, but the skin is much thinner and more in need of hydration than the rest of your face. Dehydrated skin enhances the visibility of wrinkles and betrays your skin’s real age, so plump with moisture to deceive further. The solution to your problems may come at an eye-watering price at times, but this great offering from the reputable Dr Dennis Gross, harvests the finest ingredients to hydrate skin for up to 72 hours. From moisture-inducing hyaluronic acid to caffeine and Caribbean gorgonian extract to tackle puffiness and dark circles simultaneously. This featherweight formula is non-sticky, leaving skin feeling soft and supple. Because displaying just one symptom isn’t enough, but your body wants the world to think you’re a dishevelled mess. You need a product with a myriad of ingredients poised to launch a three-pronged attack on your eyes to banish dark circles, puffiness and dehydration. L’Oreal’s Hydra Energetic Cooling Eye roll on is the perfect solution for those who lack a soft touch. The rollerball massages and soothes on application- forget storing this in the fridge, the cold roller ball applicator shocks your eyes back to normality. Hosting a cocktail of ingredients including Vitamin C, caffeine and proVitamin B5, it will leave you feeling refreshed and awake though you'll need to follow with moisturiser to lock in hydration. Starting to notice the lines? Are the crows feet settling in around your eyes? You need a cure to plump your skin and smooth out fine lines. Cue the enigmatic Vitamin A (retinol), the powerhouse ingredient that works wonders on skin concerns and most notably wrinkles. As for the solution? Get you one that does both. This Paula’s Choice serum is enriched with antioxidants to improve the skin barrier and enhance its resilience, the addition of Retinol improves the appearance of fine lines and wrinkles. It's hydrating and velvet-smooth texture and a weapon against time thanks to the unmitigated power of Retinol. This eye cream uses three main ingredients to help combat the aging process. One of them is Hydroxyproline, which may have a scary name, but it’s actually your best mate in all this. While other products on the list help to encourage the skin’s natural production of collagen, this ingredient cuts out the middleman. It’s made up of the three main amino acids that join together to create the protein collagen, which when applied to the skin, should smooth and nourish. It also includes Ginseng, which is known to liven up a tired complexion and acacia, which has anti-inflammatory properties. Together, a powerful combination, and one that should live up to expectation. As we mentioned in our introduction, Hyaluronic Acid is the ingredient you should look out for if you’re properly concerned about bags and unwanted wrinkles. Shiseido mentions that this cream has been inspired by the results of hyaluronic acid injections, so it’s no surprise that reviewers find it successful in making under eye skin appear healthier. It also boasts hydrating properties too, great if the skin around your eyes feels tight or looks dry. It’s the most expensive cream on our list but don’t forget, you get what you pay for. If you’re seeking a lightweight eye cream, this balm could do the trick nicely. From the brand that proudly derives its products from plants, this balm promises to be super-light and help smooth lines and wrinkles at the same time. In addition to being lightweight, reviewers find it to be non-greasy and comment that it helps to make their eyes look more awake – perfect if your cheeky post-work pint turned into crawling in the door at 2am. With an RRP of £30, it’s not cheap, but it’s worth mentioning that it’s the biggest bottle on our list. If you have concerns about wrinkles and the skin under your eyes feeling tight and dry, this gel could be the perfect remedy. The luxury brand promise that thanks to a special plant extract ingredient, the cream increases your skin’s ability to absorb Vitamin C.
In turn, your skin should produce more collagen, which is the secret to younger looking skin. It you’re particularly worried about dryness, this cream also features Hyaluronic Acid, which is known to keep skin hydrated. All in all, your eyes should look refreshed and younger, a good a reason as any to have this product on our list. We start this list off with an all-rounder from beauty giant Clinique. This lightweight cream is full of all the necessary ingredients for reducing dark circles and puffiness, which should make it the perfect counteract cream for stressful lives. If you find that the skin under your eyes feels tight and dry, this cream also features hydrating properties, which should leave the sensitive under eye skin feeling renewed and refreshed. Reviewers like the consistency of the cream which, according to Clinique, is fast absorbing, so it shouldn’t add too much time to your morning routine. Fed up of battling with your bags? This eye cream, aptly named Age Defender, promises to improve the appearance of aging skin, combating dark circles and crow’s feet. This is largely thanks to it’s magic ingredient, rye seed, and other fancy minerals. Reviewers seem to be really impressed with the results of the cream, with many saying they’re surprised at how quickly they saw a difference. Despite the fact that it seems thick out the tube, it’s actually pretty fast absorbing, according to some reviewers Another great all-rounder – just a tad more expensive. Never fear, Lab Series Age Rescue is here! Cheesiness aside, this light cream means serious business when it comes to leaving eyes appear fresh and revived. Similar to the Elemis product above, this cream features Ginseng as a main ingredient, so it should liven up tired eyes. The cream also features other ingredients which should help to reduce under eye puffiness and dark circles, great if you’re slogging it out at work everyday. Reviewers largely see improvements after using this cream, leading them to make a repeat purchase – certainly a sign that it should work for you, too.